You may recall last week my tale of embarrassment as I had to lift a poker magazine from the 'top shelf' in my local newsagents. Well, now there is another magazine about to hit the shelves, but you don't have to even leave the house to get yourself a copy. UK Pokernews is proud to announce the launch of our own magazine, which will be hitting the shelves in December. This glossy offering from the team that brings you the most up to date poker news and live tournament reporting, will consist of 76 pages of news, strategy and much more from the poker scene. 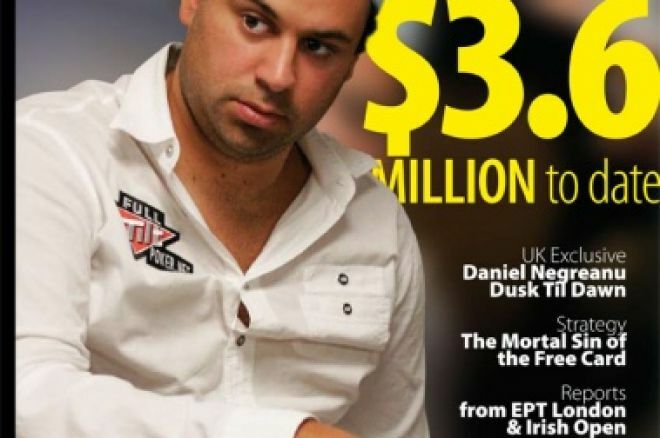 Our maiden issue includes interviews with two of the biggest names either side of the pond, Daniel Negreanu and Roland De Wolfe. We also have pages and pages of strategy, including a feature on 'the mortal sin of giving a free card'. We should have something for everyone within these pages, whether you are a complete newbie or a professional grinder. Our first issue is out next month and you can enjoy three free issues of the magazine by going to our Pokernews Magazine Page and filling out your details. To celebrate the launch we will also be sending one player to the Great British Poker Tour £500 event in Brighton in February. So now you can enjoy the groundbreaking Pokernews service on your laptop, on a park bench or even sat on the toilet. Sign up today for your first three issues free and you'll never be left in the dark about poker news again.